NOTE 2: Not all antique Metalware items should be cleaned and no general diagnosis can be applied. Each individual object must be subjected to individual attention. 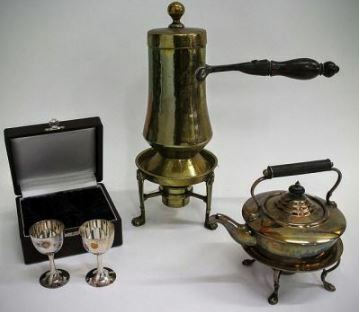 Obviously what is suitable for a pair of antique brass candlesticks of the 19th century, for example, is not applicable to a considerably earlier object such as a Sheffield silverplated tray. 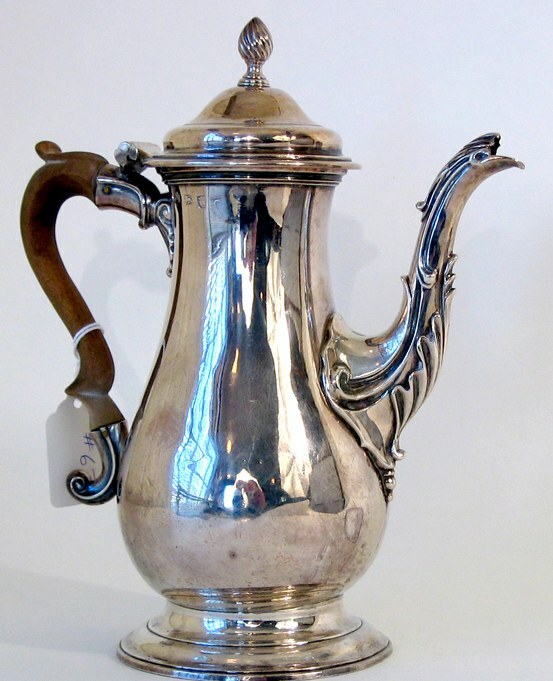 Also, the use to which an item will be put is an important consideration; for example, is your Georgian Antique Coffee or Tea Set or your pair of collectible candlesticks going to be used or are they purely for display or to be kept as cabinet pieces? If used for food or drink still more difficulties will arise. All items should be handled with extreme care until you have discovered your own abilities and the techniques that you can manage. 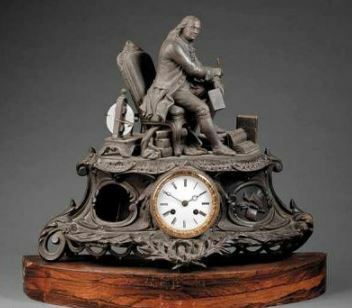 In early stages of experimentation in cleaning and polishing, you should practice on articles of no great value and, broadly speaking, the more antique an item is the less you should clean it or even handle it. Another example of an antique which does not benefit from the attempt to restore it to its original state is a piece of old Sheffield plate which shows signs of wear. The color of the metal showing through the silver - this is known technically as 'bleeding' - is to some collectors a point in its character. In any case, replating by modern electroplating will never give back the original color. The charm of antique Sheffield plate lies in the mellow color of the old silver, nowhere near as white as modern electroplating. In its own lifetime, if there were a fault or if, through heavy usage, Sheffield plate had to be repaired, this was done by French Plating. This method of restoring antique Sheffield plate uses a very fine silver foil that was laid over the worn part and made to adhere by a little gentle heat or by burnishing. French Plating is rarely used by craftsmen nowadays. Only when a piece of antique Sheffield plate has completely lost all its original plating and is reduced to an entirely copper appearance is it perhaps permissible to electroplate and then merely in order to restore it to something like its original state, especially if it were used for food. 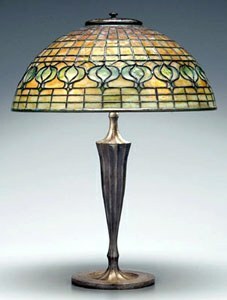 It is impossible to arrest decay on antiques completely: all one can do is to delay it for as long as possible. As in any other form of antique a moderate even temperature is required, and it is necessary to avoid extreme cold or damp. These are in effect the main essentials of what is known in an antiques museum as 'conservation'. What techniques and practices you use and how you tackle the work depends largely on whether the metal is brass, steel or pewter and of course the composition of the actual item. The age-old method of half a lemon and salt is excellent especially on a flat surface such as an antique tray. Apply, rinse off, dry carefully and clean with an impregnated wadding, polishing finally with a soft cloth. A piece of old silk is ideal; man-made fibers such as nylon tend to scratch the surface. 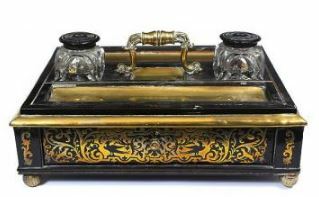 Sometimes with deeply engraved or repousse decorated antiques, extensive cleaning in the past may have clogged the pattern with the remains of old dry polishes. This should be removed with a little methylated spirit and a stiff brush and then cleaned with impregnated wadding as described above. This wadding is less likely to leave traces of cleaning material behind. 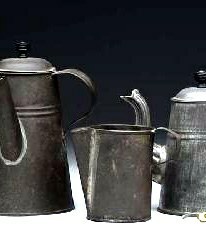 To save cleaning, and consequently to preserve antique metal ware, a modern technique much used by museums is to lacquer with a cellulose lacquer specially made for brass or copper. This should most certainly be carried out with any early or rare pieces and for pieces with fine crisp edges. The item should first be thoroughly cleaned, either as above and finished off with a succession of cloths until none is soiled, then cleaned with acetone. This should not be done in a confined space or near a flame because this liquid is very volatile. Cotton gloves should be worn to avoid fingerprints which would show under lacquer. Note: rubber gloves should not be worn as some types are destroyed by acetone. When cleaned, the piece should be lacquered with a good cellulose lacquer painted on slowly and liberally with slow easy strokes and avoiding bubbles. Do not worry too much about brush marks since these usually disappear in the drying. If the piece has been previously varnished or lacquered, this can be removed with paint stripper, following the manufacturer's directions, then treated as above. If the object is not handled too much, this type of lacquer will last for some years. 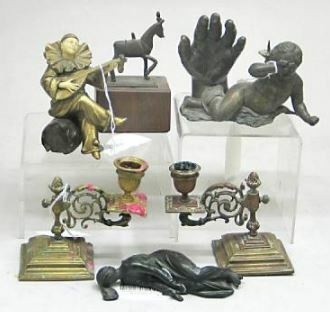 Antique bronze pieces, either in the form of a figurine or a really antique goblet or lamp, have normally over the years acquired an all-over patination, ranging through many shades of brown to green. If this patination is breaking up and there are spots of a brighter color, as for example bright green, action should immediately be taken to stop this because this efflorescence is the change in the surface of the metal which is known as 'bronze disease'. It is extremely difficult for the amateur to treat and a museum or a specialist antiques restorer should be consulted at once. For general cleaning, if this is necessary, the safest method is to use very fine abrasive powders such as rotten-stone or crocus powder or a very fine emery powder. Put on with an oily rag and work in a circular motion to avoid obvious signs of scratching. Grades of 'fine' emery paper, liberally drenched in oil, may be used for cleaning but must be used with care. Always use the finest grades and again rub in a circular motion to try and avoid scratches that show. The piece can be finally cleaned with a little white spirit or methylated spirit, dried and then oiled. Extreme care must be taken to preserve and not destroy the existing paintwork. You might find it useful to try a mixture of one-third white spirits, one-third methylated spirits and one-third linseed oil. This is a good and fairly harmless cleaning agent for antique paintwork. Apply with a cotton wool pad to a small corner of the object and see what results you get. If you are satisfied that you are not attacking the paintwork, clean the whole surface and apply a little good quality wax polish. If the piece is in definite need of paint restoration, try to find a competent professional antiques restorer who will take the job on. 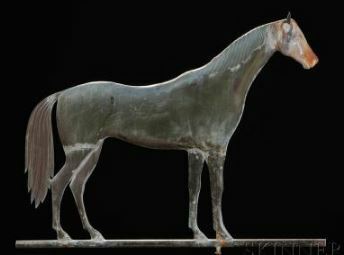 The restoration must never alter the feeling of the original piece and the object should not be entirely repainted. As much as possible, the original antique paintwork should be preserved. Do not attempt to paint it yourself unless you are experienced and competent, and then be careful not to overdo the restoration or the spirit of the original will be lost.